Aptus Light Seismic Battery Racks, for flooded batteries, are certified to IBC 2012 essential applications. 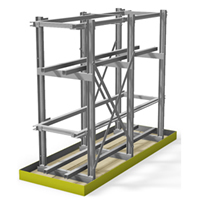 Approved by a California Structural Engineer and meet the toughest rack design standards. Universal configurations support most manufacturers’ common battery sizes.